Frequently Asked Questions - and Fiction - about Square Dancing. Who are the Gold Dust Dancers? 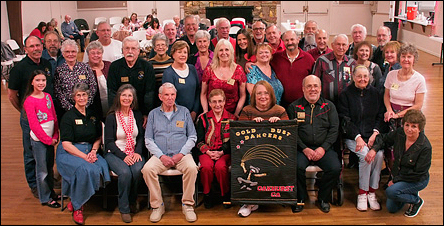 The Gold Dust Dancers are a non-profit dance club based in Oakhurst, California. There are currently 58 members, and we have been growing since 2006 thanks to friendly people, fun social activities, and most of all a square dance instruction class strongly supported by our membership. Explore this website to learn more about the things that we do! 1. What is square dancing? 2. What is line dancing? 3. Do I need a partner to square dance? 4. I learned square dancing in elementary school, and didn't like it. 5. I'm cutting back on spending. Is it expensive? 6. Is it good exercise? 7. Can you help me find another place to learn square dancing? 8. Fiction: I can't dance, I am too uncoordinated. 9. Fiction: It's all country music. I hate country music! 10. Fiction: Square Dancing is only for old people. Square Dancing is one form of American folk dance. Others include Round Dancing, Line Dancing, and Contra. Square Dancing is the most social form of dance, with four couples dancing as a group. The group dances to music while moving in formations called out by a “caller”. What makes it so fun is that you are dancing with several other people in any one square, not just with one other person, nor a whole room of people. You need not memorize songs, just the calls. Like square dancing, line dancing is choreographed dancing, led by a cuer. It is primarily footwork, a sequence of steps; done individually without physically contacting others, in lines or rows without regard to gender. The lines and rows make it possible for all to do it without running into the sides of the room or each other, as everyone is facing the same direction and executing the same steps at any time. The cuer, who in our club is also the teacher, may or may not call out or cue the steps, depending on the familiarity of the group with the dance at hand. Variations include different levels of difficulty, and some dances involve a partner. Do I need a partner to square dance? Yes. However, most times, enough single men and women come to dances so that all can find a partner when the call "square up!" is made. When, as is often the case, there are more women than men (or when occasionally the reverse is true) there is usually a rotation system set up so that you can join at a dance session or tip to be assigned a partner for that tip. Gold Dust class members are guaranteed a dance partner thanks to the generosity of our members. Also, some experienced dancers learn both positions so that they can dance any role. You may have. However, like anything in real life versus school, especially involving socializing, square dancing is much more fun when you choose to do it. Part of the fun is in the depth and challenge of the dance in its many different calls, far more than are typically taught in school. I'm cutting back on spending. Is it expensive? The first 3 classes are free! The class is just $5 at the door each week after that, for a 1 1/4 hour session. There is no prepayment or commitment. Any other dance class runs twice as much for half the time, and you have to pay for an entire series in advance. Once you have learned and go to square dances, you typically will pay $7 to $8 for 2 1/2 hours of fun, exercise and snacks! Yes! All dancing is good physical exercise. Square and line dancing is also great mental exercise! Each night of dancing is the equivalent of walking several miles. If you have more energy, you can throw in more flourish to your dance styling to really make it a workout. Can you help me find another place to learn square dancing? Absolutely! While we are convinced that Gold Dust Dancers are the best club in the San Joaquin Valley, we have friends in other clubs too, both in the Valley and beyond. There are clubs throughout the nation, and we'd be happy to refer you to a club and class that will fit your needs. Fiction: I can't dance, I am too uncoordinated. Fact: Can you tell your left from your right and remember whether you are male or female? If so, you can square dance. Unlike most forms of dance, what is important is to move around the square in patterns with the other dancers to the cues from the caller. Exactly how your feet got you there or where your arms are doesn't matter much. Line dancing is mostly coordinated footwork. Some beginners take to only square dancing, others only to line dancing; but either is okay. If you take to only one, you just sit out the other and chat with your new friends instead, while enjoying great snacks! Fiction: It's all country music. I hate country music! Fact: Modern square dancing is done to any music with a clear beat to follow. You will hear many genres of music here; rock songs from Elvis to Aerosmith, American standards, pop songs, even classical "crossover" pieces. And only now and then, country or bluegrass. Fiction: Square Dancing is only for old people. Fact: Modern square dancing hit its peak in the 1970s when it became popular with young adults. As the popularity declined (lost its fad status), many people continued dancing and naturally aged. This led to an aging demographic, which became self-fulfilling as the myth of it being an "old people" activity spread. The reality is that square dancing started as young and exciting, and it still is for younger people that discover it today. Some clubs cater to high energy youths, while others cater to a slower crowd. Oakhurst, being largely a retirement community, attracts an older crowd to square dancing just because of that. But not entirely! There are young people in Oakhurst and, when they come to square dancing, they inject the energy and enthusiasm that is characteristic of them. At the National Square Dance Convention held in Long Beach in 2009, dancers ranged in age from five years old to ninety three! The Gold Dust Dancers range in age from 30s to 70s, most of whom are quite fit, physically and mentally, thanks to years of dancing.